This is an opportunity to join Teamsters Local 690 and enjoy a highly competitive union wage and benefit package. Please contact Teamsters Local 690 and request a Hire Hall packet at 509-455-9410 or 800-841-0630, or email mlindstrom@nullteamsterslocal690.org . You may also fill out the paperwork in person at 1912 N. Division St, Suite 200, Spokane, WA 99207. Registration on the hire hall does not guarantee dispatch, as that is dependent upon qualifications and employer demand. The Hire Hall fee is $20 per month. If you are dispatched to an employer you will be required to join the Union. Compliance, Safety, Accountability (CSA) is a Federal Motor Carrier Safety Administration (FMCSA) program designed to provide motor carriers and drivers with attention from FMCSA and State Partners about their potential safety problems with an ultimate goal of achieving a greater reduction in large truck and bus crashes, injuries, and fatalities. 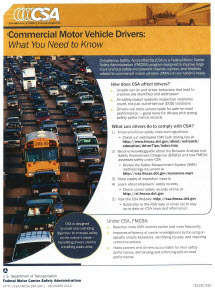 How does CSA affect drivers? What can drivers do to comply with CSA? *** VISIT THE CSA 2010 PAGE HERE.